DO-98154-05 was succesfully added to your cart. Two-Way Elliptical Valve, PP, Pneumatic, 1/2"
Use these actuated elliptical valves for liquid, gas, and vacuum applications. Valve systems are available in PP or PVDF bodies; all are FDA compliant and have O-rings made of Viton®. 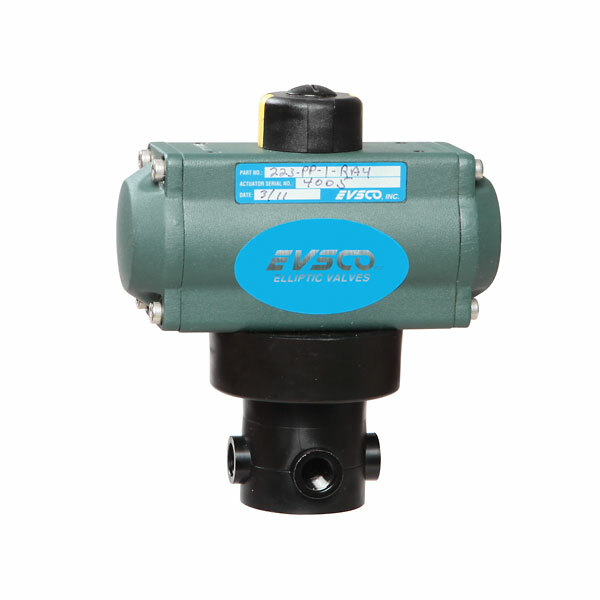 Rated for 150 psi at 73°F (10 bar at 22°C) (liquids).Pneumatically Actuated Valves are double acting air-to-air and feature 1/4" NPT(F) connection. Control time is 1 second at 40 psi air pressure. Spring return actuators are also available; please call our Application Specialists for details.